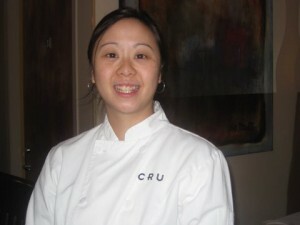 A couple of weeks ago, I spent the afternoon with Chef Alana Peckham at CRU Restaurant in Vancouver. 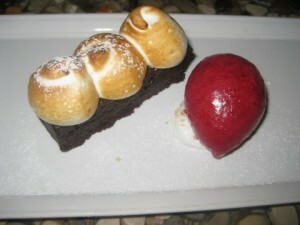 It was a pleasure to finally meet Alana and to chat with her about her passion for food, pastry and wine. 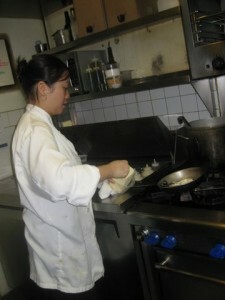 In 2001/02 she went to Dubrelle Culinary School and did culinary and pastry school then worked at Feenies for 6 months. 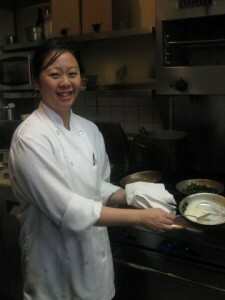 She then worked at Lumiere for 1 year and then to CRU where she have been for the past 6-1/2 years as Executive Chef. 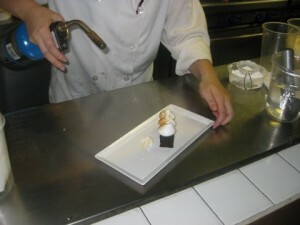 Local ingredients, west coast, flavours that will impress you. Are you doing everything at CRU? Yes I do it all from savouries to pastries. How do you do your Winemaker Dinners? We do a 4-5 course menu with our winemakers dinners here, the wine makers give a presentation before and during dinner describing their wines and usually do a wine tasting before the dinner begins. Which farms do you support locally for your produce? Sapo Bravo Farms (Gabrielle) in Lytton who brings me fresh produce from June – October, and UBC farms every Saturday during the summer months. Would you develop your recipes around what vegis and fruits you get from your farm suppliers? Yes I place weekly specials and dishes based on the fruits and vegiès I can get. I go shopping daily at Granville Island market and I love it. 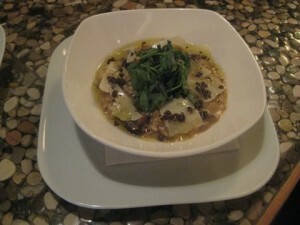 For a vegetarian option that would fill someone up and to be in the same calibre as the other dishes. The wine list is colour coded to match the colour coding on the food menu so guests know which wines will pair well with the dish they are ordering. Where is your favourite food city? Which food cities do you want to visit next? Asian food is better in Vancouver than China. What are your favourite restaurants in Vancouver (outside of where you work)? 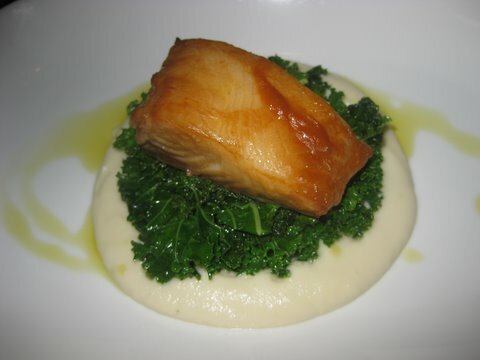 I wanted to use UBC kale and cauliflower, so married them both with sablefish and miso. What is the best wine pairing for the first & second dishes you prepared for me? A Pharmacist, however over the years my family suggested that I go in to cooking. Did you ever see yourself working a large restaurant? No I prefer a smaller restaurant where I can handle everything, I am more hands on. Yes but I make big batches and then freeze them so that I have fresh food that I can eat when I am home after a long day at work. What are the favourite ingredients we would find in your home pantry? Flavour profiles of hot chocolate and marshmallows. Do you have any regrets not becoming a Pharmacist? No I love cooking, it is my passion. What’s the next 3 – 5 years hold for you? Not sure, I like balance and why leave a good thing!